Is a gyro a sandwich? Yes, dummy, it is. Pita bread is one of the world's great breads, and the warm, soft pita served at Market Grille Cafe is decent stuff. 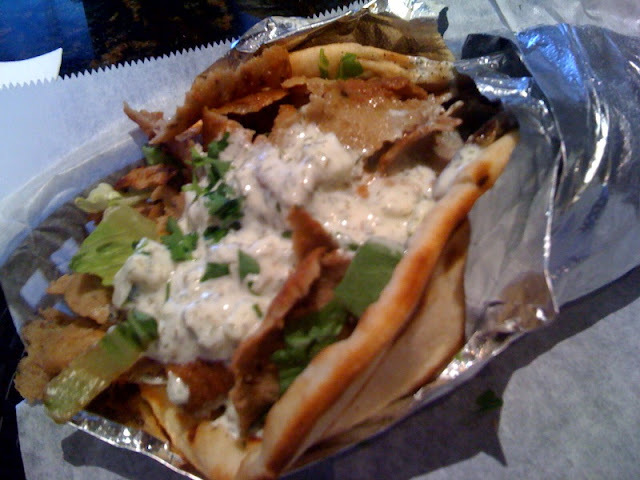 Even better is the flavorful blend of beef and lamb inside its traditional gyro, well spiced and ultimately savory. Anybody who says Mediterranean food can't be meaty-delicious needs to try one of these, especially because MGC serves a generous portion of meat in its gyros. Topping it off, you've got chopped lettuce, red onions, tomatoes and cucumbers, with a sprinkle of feta cheese and a slathering of creamy yogurt dill sauce. There are so many mingling flavors going on in this sandwich ... how could you have ever questioned it's validity in the first place? Shame on you!